Description of "Two theorems and some tips to solve problems on number theory (eBook)"
Electronics Projects Vol. 21 by EFY Enterprises Pvt. Ltd. 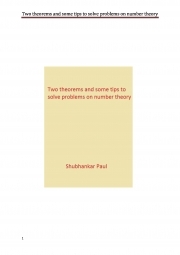 Reviews of "Two theorems and some tips to solve problems on number theory (eBook)"